Earn 114 points to spend on future purchases. The Total Face Mask is a comfortable alternative for people who may not be able to obtain a good seal with a nasal mask, nasal pillows interface, or traditional full face mask; or those who experience skin breakdown, or are claustrophobic. Because the Total Face Mask covers the entire face, there are no pressure points around the nose to cause sores or skin breakdown. An effective seal is created around the outside of the face as air pressure from the system inflates the soft, flexible sealing layer. 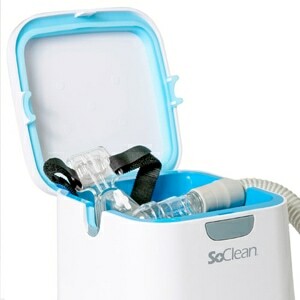 This minimizes leaks while providing optimal airflow through the nasal passages. And, because air pressure is able to circulate throughout the mask, it allows for more natural, comfortable breathing during therapy. 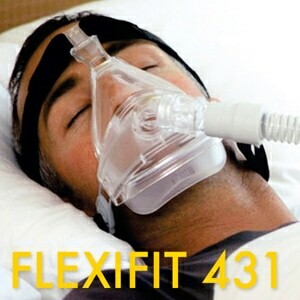 Made of clear plastic, the lightweight faceplate adds to the comfort of Total Face Mask. It does not obstruct the patient's vision, which helps to minimize the feeling of claustrophobia that some patients experience. 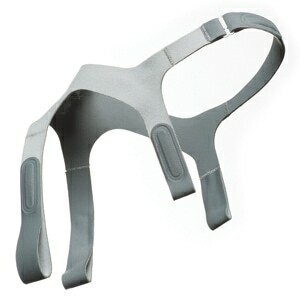 The Respironics Total Face Mask comes with comfortable, easy-to-use headgear. Sturdy cloth sidestraps and a mesh crown strap keep the mask evenly and securely in place and help to prevent mask leaks. Adjustable Velcro tabs on the straps attach to hooks on the faceplate of the mask for stable placement. USAGE NOTE: The manufacturer cautions this mask should not be used if you have glaucoma or dry eyes. The ordering process was amazing, simple and convenient. My total face mask from Directhomemedical was shipped and received rapidly. 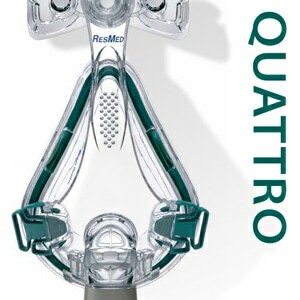 This is the only supplier that I can purchase this mask and they have excellent service. Customer service is responsive and their reps are always concerned with your needs. 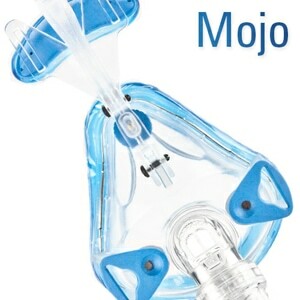 Some ventilator users can only tolerate this mask and not the newer total face mask from Respironics model. So please, keep it on stock. It will not seal around my face, I use a b-pap and I will not de rebuying this item. I have the same complaints as everyone about the drawbacks of this mask. But, it's the only mask that I can use a wake up without fluid accumulations in the bags under my eyes and strap marks on my face. I use another mask, for comfort, most of the time. But, if I have to be somewhere important in the morning, I'll use this mask so I'll look presentable. If you have trouble with puffy eyes and strap marks, this mask will help. I have been using the Total Face Mask and I love it. Yes there are occasional problems, however, show me a mask that does not have any issues. I have tried most of the different types of masks and this is the only one I have been able to tolerate and use every night for the past five years. I have claustrophobia, so this mask has alleviated my discomfort with other masks. I highly recommend the Total Mask! I can't believe this ever made it out of the lab. It looks like a first-grader's project. Or the concept of a CPAP mask to give management a general idea of what the "engineers" are kind of thinking about sort-of but in a general way... This is a disaster. The "documentation" is just as insulting. It's a 100-page booklet in 50 languages with only 2 sparse pages each. It is really, really hard to believe this got manufactured. I own 6 masks, different types. I can use all of them to some degree. This mask is an absolute joke. If you want to try full face - DO NOT BOTHER WITH THIS GARBAGE. Try the FitLife instead. I needed this mask to work. The seals are too light weight. If they beefed up the SEAL material, especially along the sides it would be great I think. Also, the shape is just an oval. It should narrow in the cheek area as faces are not perfect ovals. Too large for my face, leaks, and very noisy. Found that this mask always leaks even when you think you have a good seal. It is especially bothersome because the leaks usually occur around the ears. Don't buy it until they improve the ability of the mask to seal along the sides of the face. Liked the idea, wanted to like the mask. Design cut into my double chin (uncomfortable), was very noisy compared to my nasal pillows mask, and kept getting small leaks, especially when I moved. Gave up after 5 hours and switched it out. This is an Extremely Noisy Mask. So Noisy that I generally don't use it. I got it because I liked the fact that it captured the underside of the chin, and it does have a great fit and feel, but the noise is too loud for me to take.